This Citizen Eco-Drive men's stainless steel bracelet watch is perfect as an everyday timepiece. 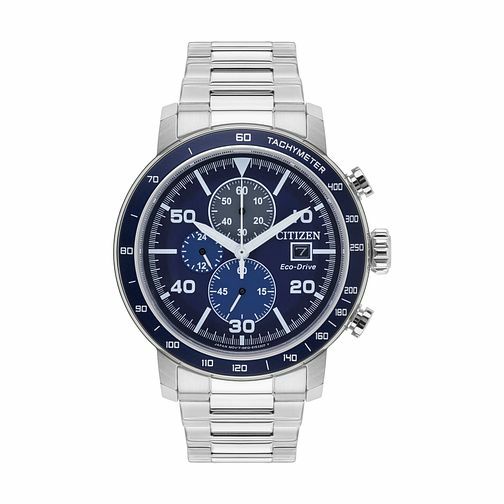 With its distinctive blue chronograph bezel and matching dial features, this watch is sure to make an impression. The dial also features sub dials displaying 24-hour time and a discreet date window. Citizen Men's Eco-Drive Stainless Steel Bracelet Watch is rated 4.9 out of 5 by 13. Rated 5 out of 5 by Anonymous from Great blue tones and solid build This watch has a great blue chronograph face and bezel that stands out from the usual black and silver bezels. Good size for a sports watch and received compliments when wearing with casual clothes.